This tasting compares an aged Burgundy with a young Burgundy. Two Pinot Noir wines from New Zealand in two price ranges are also tested and compared to the Pinot Noir wines from Burgundy. The tasting will find out if expensive Burgundy is worth its price, the difference between an aged and a young Burgundy and if Pinot Noir from New Zealand can compete with Burgundy. Many of the suggested wines on this web site may be bought in your country. Refer to Wine Searcher to find retailers. When Pinot Noir is good, then it is not only good, it is an euphoric experience. But that requires a good year and that serious growers and wine producers have been involved. Red Burgundy, which always is made of 100 % Pinot Noir, is prestigious, expensive and the demand is great. Prices have risen to hysterical levels and this attracts unscrupulous wine merchants to carelessnes and to place mediocre Burgundy on the market. Much of the red Burgundy sold is not good and not worth the price. The colour of red Burgundy is light, much lighter than most of other great wines. What is it then that makes the Pinot Noir grape so beloved? For one thing, it gives soft wines. Although there are tannins, they are very soft, the wine feels like silk in your mouth. Then the wine smells and tastes seductively of ripe red berries such as raspberries, strawberries and cherries. Notes of oak vanilla and herbs may also be there. When the quality wines age they get complex flavours of mushrooms and autumn forest. Pinot Noir is living high on its great reputation but it is difficult to make good wine from Pinot Noir. However, if the winemaking is successful, the result is wonderful! The grape variety is very sensitive and requires ideal conditions which only Burgundy and a few other places outside Burgundy, such as California and New Zealand, exhibit. Burgundy is located in the far north and it may be difficult to get the grapes to ripen. A cool climate, warm but not too hot, good drainage, meticulous growers are necessary for Pinot Noir to give its best. 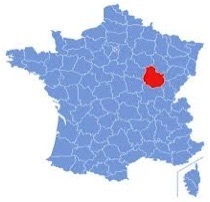 Burgundy is located in eastern France, the center of the wine region is the Côte d´Or. Côte d´Or is divided into two parts, the north east is called the Côte de Nuits and the south is called the Côte de Beaune. Côte de Nuits is most famous for its red wines. Nowhere is the effect of "terroir" (the impact of location, soil and climate) so pronounced as in Burgundy. The location of the vineyard is critical in the cool Burgundian climate. A few extra minutes of exposure to the sun every day can be the difference between a good and an outstanding vineyard. Burgundy is composed of thousands of small-scale growers, often with only tiny parcels of land. Each property may make a range of a dozen or more different wines and each wine has its own name and its own character. A very significant part of the production comes from négociants, merchants who may own no vineyards, but who buy grapes and finished wines for blending and bottling under their own label. It is therfore very difficult to buy wines from Burgundy, you must know both the vineyard and the producer. It is best therefore to follow the recommendations of the connoisseurs regarding the choice of red Burgundy. The system of naming wines In Burgundy is rather complicated.The property name is rarely stated on the label if it not of the highest quality as Premier Cru and Grand Cru. Instead, the name of the municipality is stated. The difficulty is that every small plot usually have several growers, growers who do not make the wine themselves but sell to a merchant, a so called negociant. And it is therefore more important to know the name of the merchant than grower or the vineyard. The simplest wine, which can come from anywhere in the region, is Bourgogne Rouge. 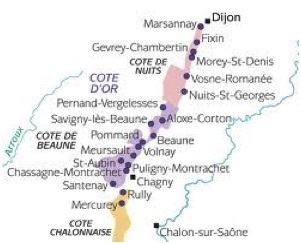 Next follow regional appellations such as Côte de Nuits-Villages. Any Côte d´Or appellation does not really exist. Most municipalities in Côte d´Or have their own village appellations, such as Gevrey-Chambertin or Vosne Romanée. Premer Cru is used for the second best vineyards and the name of the vineyard is stated on the label. The best quality, Grand Cru, come from vineyards which are own appellations contrôllées and therefore the municipality name is not required on the label. An example of this is Le Chambertin, which is a Grand Cru wine from the vineyard Le Chambertin in the municipality Gevrey-Chambertin. 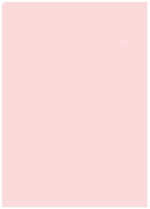 Many of the suggested wines on this web site may be bought in your country. Refer to Wine Searcher to find retailers. The number below links to Systembolaget´s information in Swedish. 1997 Morey-Saint-Denis from France, Burgundy, Côte de Nuits, Morey-Saint-Denis, nr 71084, price about 30 euros. Producer: Louis Jadot. Light-bodied with soft tannins, developed, complex aroma and flavour of strawberries, cherries, tobacco, liquorice and mint. Alcohol content 13.0 %, medium oak character. 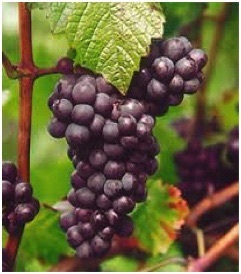 Grape variety: Pinot Noir. 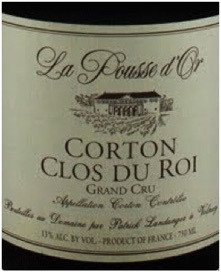 2011 Corton Grand Cru Clos du Roi, Domaine de la Pousse d`Or from France, Côte de Beaune, Aloxe-Corton, Corton, nr 96098, price about 60 euros. Producer: Domaine de la Pousse d´Or. .
Light-bodied with soft tannins, Complex aroma and long lasting flavour of black cherries, rhubarb, currants, mushrooms, ferns and wet stone. Alcohol content 13.0 % mediium oak character. Grape variety: Pinot Noir. Can be stored. 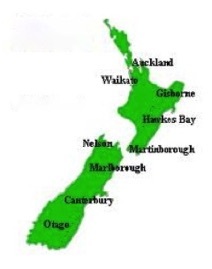 New Zealand consists of a North Island and a South Island. Central Otago on the South Island is the southernmost wine region. Unlike the rest of New Zealand the winter and spring can be cold. The summer is hot, however, which combined with the rocky soil have made the Pinot Noir grape king of the vineyards. Pinot Noir from the South Island has reached international success mainly due to low harvest yield and built-in quality thinking all the way from vineyard to cellar. The oldest vines are barely 30 years old, most of them are between 15 and 20 years. And yet, the wines are of high international class. New Zealand´s wine legislation is liberal and only requires that at least 85 % of the wine must be made of the specified grape varieties and the grapes come from the specified area. Gumfield´s Pinot Noir from New Zealand, Marlborough, nr 6407, price about 16 euros. Producer: Gumfield´s Wines (no website). Cloudy Bay Pinot Noir from New Zealand, Marlborough, nr 99479, price about 24 euros. Producer: Cloudy Bay. Light bodied with soft tannins. Nuanced aroma and flavour of ripe strawberries, cherries, ginger, cranberries and herbs. Alcohol content 13.5 %, minor oak character. Grape variety: Pinot Noir. Some wines take longer time to show their best. But which wines are worth storing? Generally, one can say that the wine must be of good quality, which often is equivalent to expensive. Red wines have the best aging potential due to the preservative effect of the tannins. Red wines that have been aged in oak barrels will also keep longer. When it comes to red Burgundy, also the more expensive ones, they are best enjoyed young, fruity and fresh. When Burgundy wines age they develop more complex aromas and tastes. When this will happen is depending on quality, vintage and how the wine has been stored. The complexity of a well-aged Burgundy is what made the region famous. However, it is not easy to find aged Burgundy to purchase. Wines from the New World are usually ready to drink and do not get better with storage. 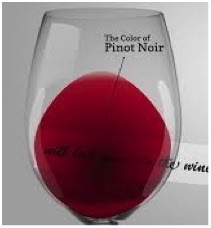 Producers of New Zealand Pinot Noir claim however, that the wines can be aged for up to ten years. Like Burgundy wines they develop more complex aromas and flavours with time. These wines are ideal with red meats in rich sauce, such as boeuf bourgignon, fried wild poultry and fried or grilled red meats. Even chicken in red wine sauce or cooked with garlic goes well with these wines. Boil together water, chicken stock, wine, cream and apple sauce with anchovies for 10-15 minutes. Peel the Jerusalem artichokes, yams, potatoes and carrots and cut them into pieces. Cut the chicken fillet into pieces and cook together with the vegetables in the sauce until they are almost soft, about 15-20 minutes. Cook the unpeeled beetroots on their own (otherwise they will discolour the dish) for 15-20 minutes. Peel the beetroots under cold running water by pushing away the skin with your fingers. Add the broccoli broken inte pieces. Finally add the sugar peas and beans and the sausages. Bring to boil and serve when hot. The recipe is taken from Newsletter of Philipson & Söderberg.